Hyperloop Austin To San Antonio? Hyperloop confirmed as potential option for Dallas-Fort Worth corridor; is SA next? The team is appropriately named, since the route would potentially cover Dallas to Laredo to Houston and several major cities in between. The good news for San Antonio? The travel times to major Texas cities could get majorly slashed. “The excitement around Hyperloop is in its potential to reimagine transportation by eliminating the barriers of distance and time,” said Michael S. Burke, AECOM’s chairman and CEO. Another added benefit of a Texas Hyperloop is the positive impact it would have on the environment. A Hyperloop One rail system would cut Texas’ carbon footprint and help eliminate traffic gridlock in major communities like Dallas, Fort Worth, Austin, San Antonio, Houston and Laredo. A Hyperloop is a proposed mode of passenger and/or freight transportation, first used to describe an open-source vactraindesign released by a joint team from Tesla and SpaceX. Drawing heavily from Robert Goddard‘s vactrain, a hyperloop is a sealed tube or system of tubes through which a pod may travel free of air resistance or friction conveying people or objects at high speed while being very efficient. Elon Musk’s version of the concept, first publicly mentioned in 2012, incorporates reduced-pressure tubes in which pressurized capsules ride on air bearings driven by linear induction motors and air compressors. 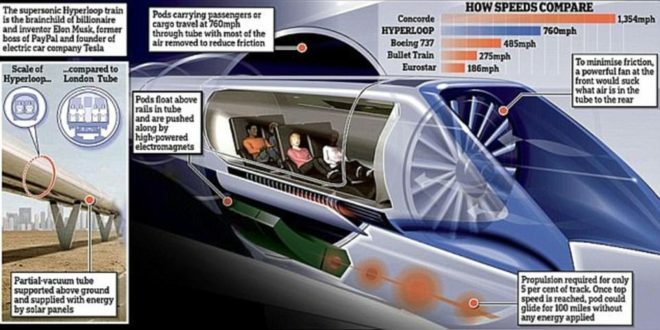 The Hyperloop Alpha concept was first published in August 2013, proposing and examining a route running from the Los Angelesregion to the San Francisco Bay Area roughly following the Interstate 5 corridor. The paper conceived of a hyperloop system that would propel passengers along the 350-mile (560 km) route at a speed of 760 mph (1,200 km/h), allowing for a travel time of 35 minutes, which is considerably faster than current rail or air travel times. Preliminary cost estimates for this LA–SF suggested route were included in the white paper—US$6 billion for a passenger-only version, and US$7.5 billion for a somewhat larger-diameter version transporting passengers and vehicles—although transportation analysts had doubts that the system could be constructed on that budget; some analysts claimed that the Hyperloop would be several billion dollars overbudget, taking into consideration construction, development and operation costs. 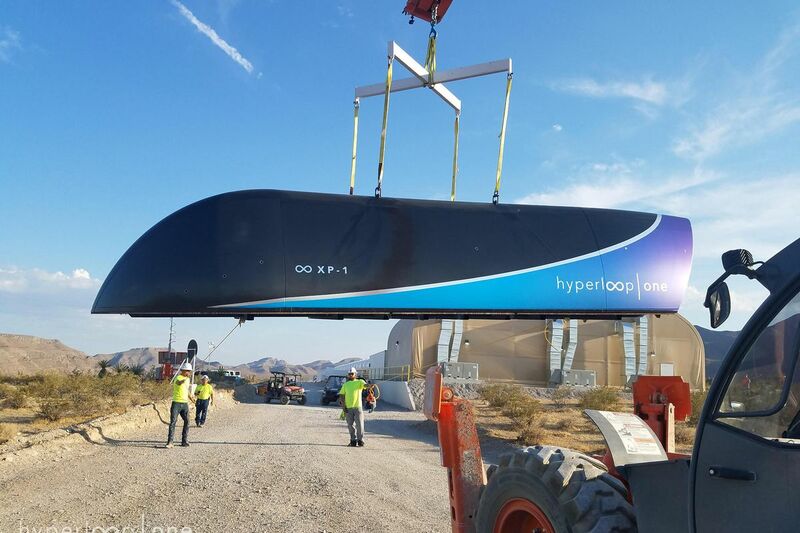 The Hyperloop concept has been explicitly “open-sourced” by Musk and SpaceX, and others have been encouraged to take the ideas and further develop them. To that end, a few companies have been formed, and several interdisciplinary student-led teams are working to advance the technology. SpaceX built an approximately 1-mile-long (1.6 km) subscale track for its pod design competition at its headquarters in Hawthorne, California. Some experts are skeptical, saying that the proposals ignore the expenses and risks of developing the technology and that the idea is “completely impractical”. Claims have also been made that the Hyperloop is too susceptible to disruption from a power outage or terror attacks to be considered safe.